Jennifer Hickey at the Sedona, Az. Marathon. At each race, she ran with a photo of the soldier whom she was running the race for. When Jennifer Hickey completed last year’s Oklahoma City Marathon, there was a big surprise waiting for her at the finish line. Hickey had dedicated the race to Army Sgt. Daniel Eshbaugh, a member of the Oklahoma National Guard who was killed in September 2008 in a helicopter crash while serving in Iraq. He was one of the dozens of fallen soldiers honored by the D.C.-based runner last year, in her quest to run at least 53 marathons in 2018 to remember those who died serving their country. Eshbaugh’s widow, Rachel, and her daughter, Jordan, were there to see her finish. “I think I was more emotional than they were,” Hickey said. Hickey’s initial plan was to run 53 marathons last year, representing one fallen soldier from each of the 50 states, plus Washington, D.C., Puerto Rico and the U.S. Virgin Islands. She met her goal at the 2018 Marine Corps Marathon in October. “But I wanted to run Philly and a few others, so I ended up running 60 marathons for the year,” Hickey said. This year, she wants to run 56 marathons in honor of her parents, both of whom died of cancer. Her father passed away 41 years ago, and her mother passed away on Dec. 7, 2018. This September will mark their 56th wedding anniversary, Hickey said. That same month, she’ll run the Berlin Marathon as a charity runner, raising money for The American Cancer Society. Hickey, 48, estimates she’s run 130 to 140 marathons since she ran her first marathon, the 2012 Marine Corps Marathon. She quickly grew to love marathoning, and in 2014, decided to set a goal of running 14 marathons that year. At the time, she hoped to raise awareness of Comfort Zone Camp, a bereavement camp for children who have lost a parent or another close family member. Their mission touched Hickey, who was just seven years old when her father passed away. “It allows the kids to not feel so alone,” she said of the camps. That year, Hickey also discovered the Marathon Maniacs, a group for runners who run multiple marathons a year. By the end of 2014, she had doubled her initial goal. Her desire to run for fallen soldiers several years later stemmed from her own personal connections to the military. A writer by trade, she previously worked for the Reserve Officers Association. She also has several family members who have served. Hickey connected with The Travis Manion Foundation, a Pennsylvania nonprofit that links veterans and families of fallen heroes with community programs focused on growth and empowerment. The foundation was named after 1st Lt. Travis Manion, a Marine who was killed in Iraq in 2007 by an enemy sniper while protecting his fellow Marines. TMF put her in touch with some of the soldiers’ families, while others she found through Facebook. In many cases, such as with the Eshbaughs, Hickey was able to meet the families in person and give them her marathon medal. “It’s very humbling, because they are so grateful,” Hickey said. Eshbaugh said her husband, a family man known for playing pranks on his fellow soldiers, would have been in awe of Hickey’s goal. “Running a marathon was high on his bucket list,” she said. At last year’s Rock ‘N Roll D.C. Marathon, Hickey got to meet the widow and son of Petty Officer 2nd Class Kenneth Owens, a Navy diver from Chatham, Mass. who died in a skydiving accident just a few days before he was scheduled to deploy to Iraq. Alahnna Widhalm, Owens’ widow, said in a video released by TMF that Jennifer’s mission goes to the heart of what the foundation is all about: Strength of character. “The first question I asked about Jennifer was, is she a survivor? How does she fit into this puzzle? And to hear that she really doesn’t have a loss, a personal loss, from a military standpoint, is really what’s so humbling for me,” Widhalm said. Morgan said Hickey demonstrates how anyone can be of service to others, even if they don’t wear a uniform. “She is a prime role model for all generations, and shows the true strength of our national character. It is our responsibility to honor those who sacrificed their lives for our freedom, and Jennifer is leading that charge in such a powerful way,” he said. Running 60 marathons in one year was admittedly a lot to juggle. Because Hickey’s mother was undergoing cancer treatments, it was tough to plan too far in advance, so scheduling the races was a week-by-week occurrence. Hickey is also legally blind, and sees 95 percent out of her left eye. While that doesn’t stop her from running, she is unable to drive and relied on friends she made through running to help her with transportation to races. Sometimes, she crammed multiple marathons into one weekend. Another time, she ran five marathons in five days in Oregon and Washington state. “It was a little bit of a balancing act,” she said. Hickey managed to avoid injury by treating each marathon as a long run, and sticking to group fitness classes and shorter treadmill runs during the week. 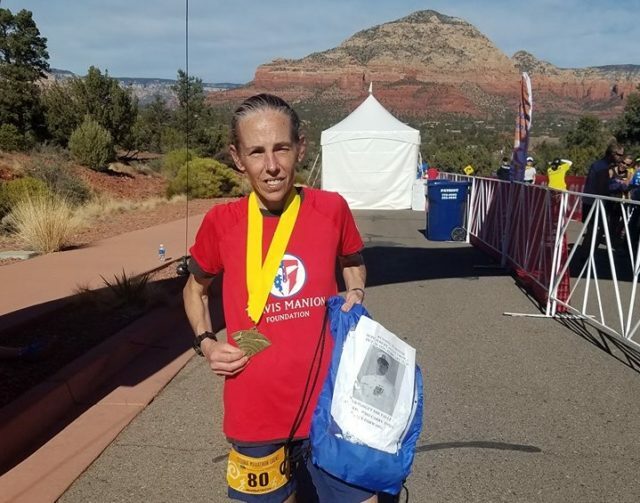 She has a PR of 3:31 and has run the Boston Marathon three times, but said she had no strict time goals for her 2018 marathons. Her 2019 marathon goal was born out of her frequent trips to Richmond, Va. last year to see her mother, whose cancer treatments took place about 20 minutes away from her home. Because Hickey doesn’t drive, they used the American Cancer Society’s volunteer driver program to get to the appointments. “All of the funding for that program comes from donations, and I think that’s an aspect of the American Cancer Society that people don’t think about,” Hickey said. Above all, Hickey said she wants to continue running as a way to honor those she admires the most.